Tonight, David prepared a traditional West African dish for me — alloco. 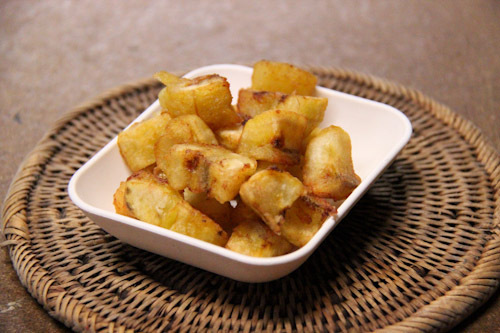 Deep-fried plantain pieces is a favourite of mine and takes me back to my childhood in Africa. 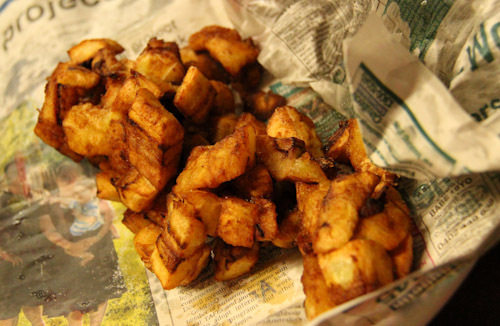 Deep-fried plantains ("alloco") is my favourite African street food. 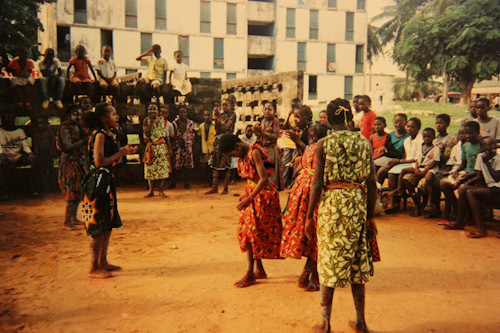 I grew up in the West African nation of Cote d’Ivoire, and it was here that I was introduced to alloco. “Street food” — sold by vendors on the side the of the road — was a treat for us, equivalent to take-away fast-food, and my parents would buy alloco occasionally for a snack or to supplement our evening meal. When we were home, Friday nights were our favourite. My two sisters and I were each given 100 francs (cfa) and sent out to find our own food. At the time, 100 francs was worth about 30 Australian cents. I could divide up my 100 francs to buy 50 francs of alloco and a piece of baguette with a brochette in it. It was yummy! With inflation, prices went up, and our 100 francs slowly grew to 250 francs — still less than a dollar — but we would eat really well. My family would always buy our alloco from the same person — a woman we knew only as “Tantie” or “Auntie”. She sat under a tree close to our apartment building and on the pathway to market, cooking up alloco in a great big pot of oil. Tantie greeted us every time we walked past, but in a confusing way. I could never work out if her “Ça où va?” was asking how I was or where I was going. When David brought the plantains home, they were hard and green. Remembering the ones that Tantie would use, I said they needed to be soft and black before they were good for alloco. Tonight, although they weren't completely black, we cooked them up. 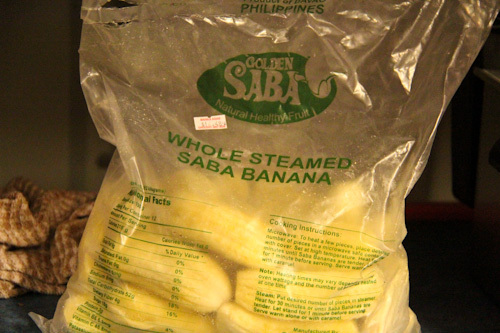 Plantains are sometimes also available as frozen food. These are exported from the Philippines by a company called Sagrex. 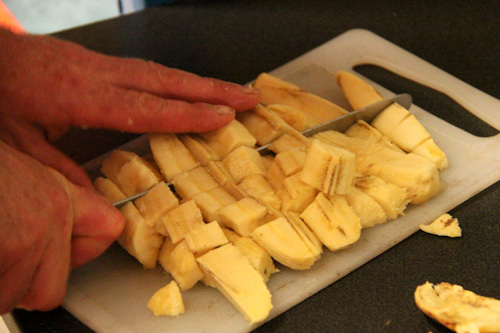 Cutting up the plantains, we leave them in chunky pieces rather than cutting them finely. 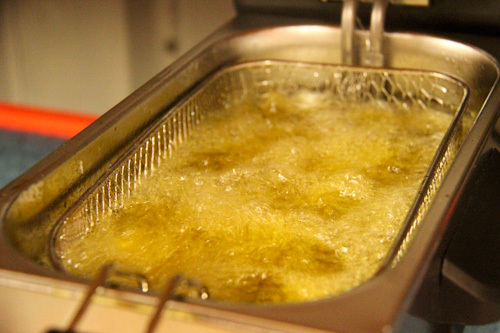 We deep-fry our plantain pieces in olive oil. In Africa, it's cooked in palm oil. 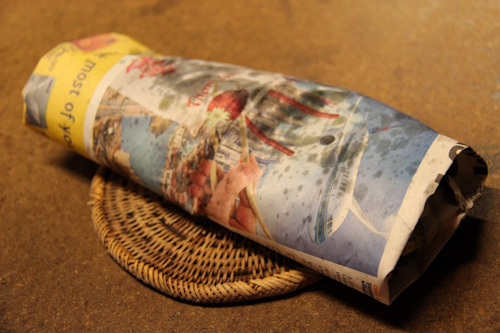 David presents me with a tidy package of alloco wrapped in newspaper — for old-time's sake. 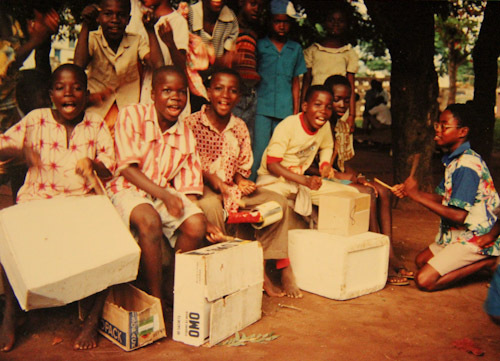 In West Africa, street food is always served in recycled paper — often newspaper, sometimes office sheets or school reports. The paper absorbs the extra oil as well as providing some reading material to enjoy while eating. A small sprinkle of salt sprinkled on top makes the hot alloco even yummier. Alloco is called dodo in Nigeria and kelewele in Ghana. Plantains are also great grilled over coals (or on a barbecue). They’re available in supermarkets that cater to an immigrant clientele, so you could try making alloco too. If you’d like to try more West African recipes, the best books are available online for free. Wild Boar on the Kitchen Floor and The Crocodile Cookbook are both fine collections of traditional African recipes and Western dishes prepared with African ingredients. It was fun introducing this part of my childhood with our children. I don’t know if I’ll ever go back to where I grew up, so I’m starting to share more of my memories before I forget the background that has made me who I am today. 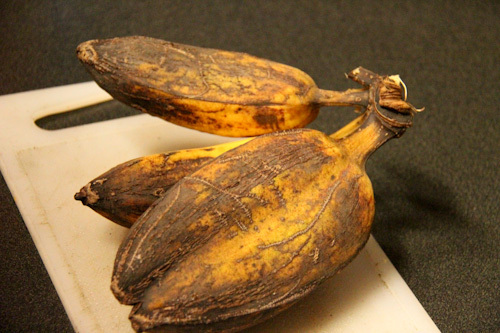 Now if you see plantains for sale, you’ll know what to do with them. Once you try alloco, you’ll be hooked! And please let me know if you give fried plantains a go. Mmmmm alloco… that looks so good! Do your kids like peanut sauce & rice? It’s one of the favourites @ our house. It’s fun that we can give them a little taste of Africa even though we’re so far away. Love it! I make alloco every few months although the last time was back in November for a non-traditional Thanksgiving. :) Great post. Yummm. I love fried plantain. I don’t deep fry it, just use a generous amount of coconut oil in a pan and turn it, then sprinkle with salt. So yummy! That looks yummy! makes mental note to look out for plaintain when near a supermarket! There is a restaurant here that serves deep fried plantain as a garnish on our favorite steak dish. I think Matt likes the garnish better than the steak! When we were in Washington DC, the Wholefoods supermarket across the road from our hotel had a hot buffet every night. One of the choices was alloco! You can guess what I had every night! Oh, and you know how my favourite hangout place was next to Tantie, well, I have to tell you that the alloco was not put straight into the newspaper. It was actually placed on a recycled sheet of used white office paper which had come from who knows where and then wrapped in the newspaper. 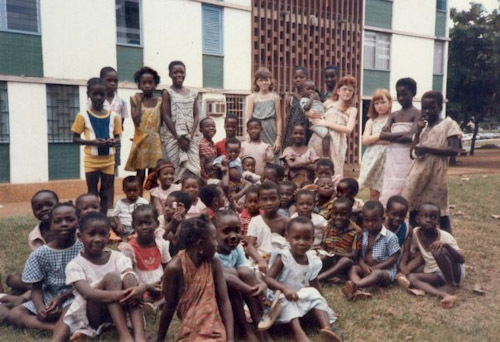 I spent a large part of my childhood living on a island in the Northern Territory where we were the only white family – my mother ran the clinic on the island. It was such a wonderful experience and one I would dearly love to replicate for my own children, but I know it won’t happen for a number of reasons. Sometimes I like to show them photos of the island or where it is on a map, but in terms of feeding them the kind of foods we ate I doubt I’ll be able to get my hands on much turtle egg or snake haha! Alloco and meatsticks: my favorite Abidjan street food combination! (with the red pepper powder to dip the meat in too…) C’est bon, dèt!!! Great story and visuals. Thanks for the cookbooks. Now I know what to do with plantains ! What wonderful childhood stories and pictures. So unique. And I like that you can read the paper it comes wrapped in ! LOVE the pic on the top of your blog. GORGEOUS! It’s interesting to see how plantains are eaten in Africa and are very similar to how they’re eaten and loved in Central America. My mom always sprinkled sugar on them, but I bet she’d like them with salt, too!